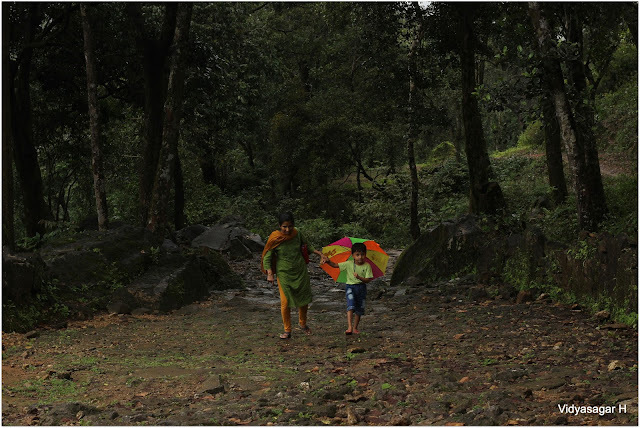 Place always vary from time to time; most glorious period is Monsoon. Yes! 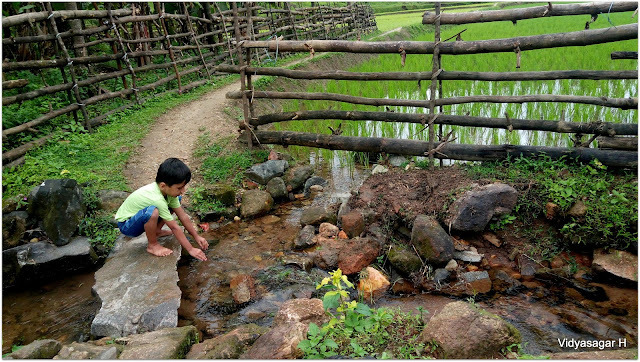 indeed, I had been at Kavaledurga in summer and monsoon. The first visit was in summer with friends while attending the Yakshagana play at my friend home, this time in peak Monsoon with my kid and better half on weekend 27th August 2016. 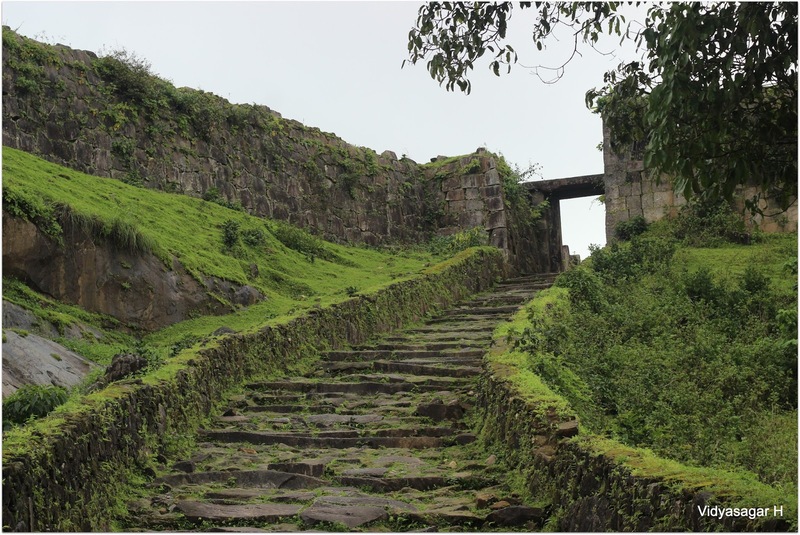 Kavaledurga is ruined fort near Thirthahalli [Shivamogga District] which is around 60 KMs away from home [Muniyalu]. 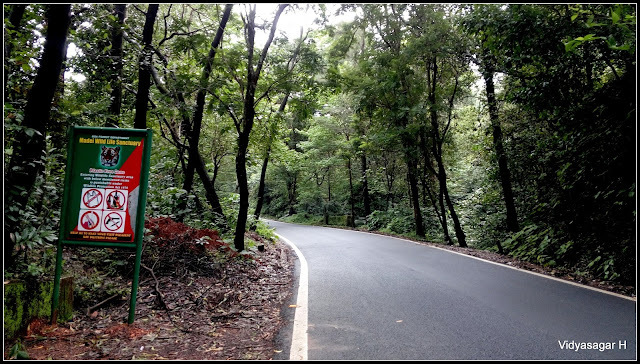 It was my first skill test of Agumbe Ghat ascend driving and I completed successfully. 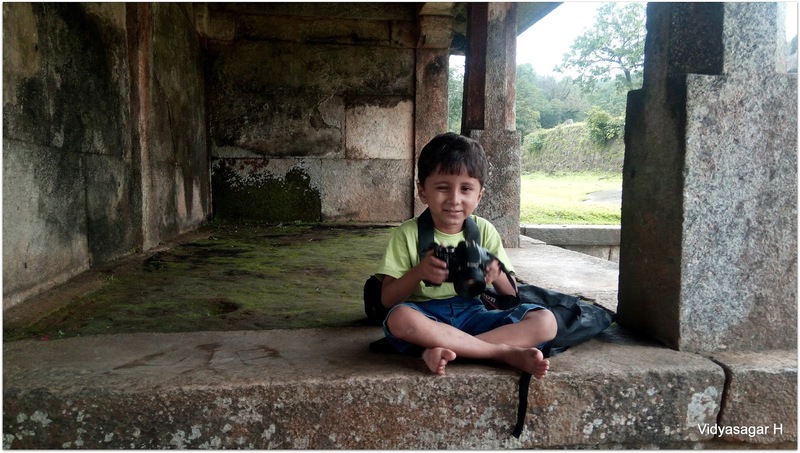 My son “SUMUKH” had lot of questions during the journey. We parked the car in the parking lot, continued our small trek towards Fort. Rain was pouring heavily in between a small break. I had not seen even a single vehicle or traveler on the way. Sumukh started his innocent queries and which thoughts were passing in his mind. 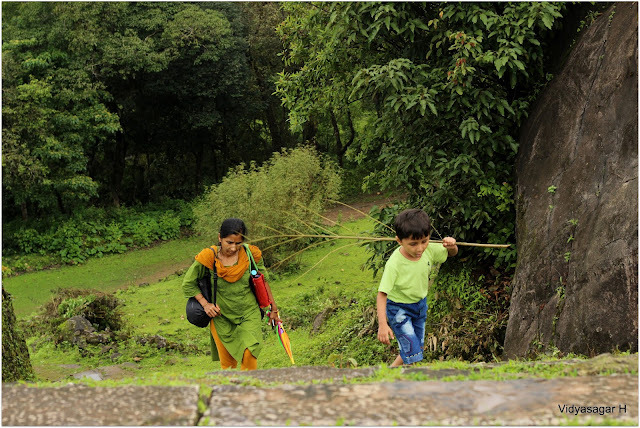 “Why we are going to this fort when people are not there? What are the wild animals in this surrounding? If snake come out bite us? if thieves attack on us?......” endless. Really, he was scared about the lonely place with monsoon heavy rain. Our conversation went on and reached the fort. Lonely fort was looking so beautiful decorated by green. We spent good time, son and better half were so happy to taking this wonderful place. Thought not to take risk, started descending journey and reached home safely before too dark. We all knew the day will be very tough definitely. Morning birds whisper made us to wake up very early around 5 am. Quickly finished our morning core job, packed the luggage, and all set to continue the final day journey. One more round we had photography session and continued towards Sanquileum. 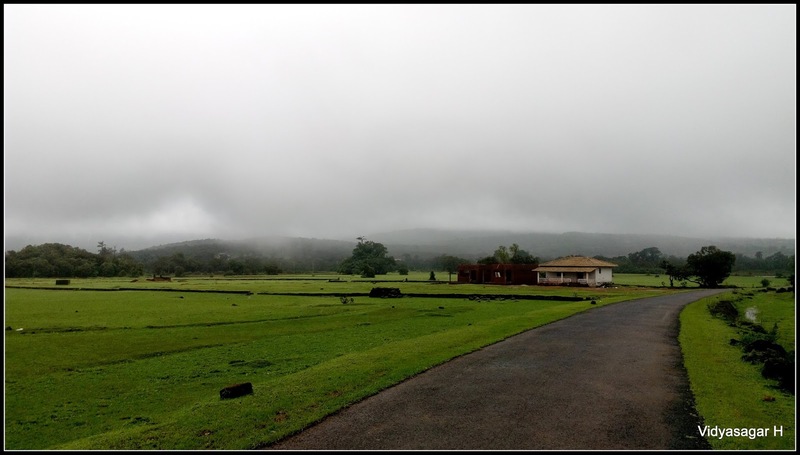 On the way we come across historical caves which are preserved well. Now the time is to fill our stomach of Breakfast. 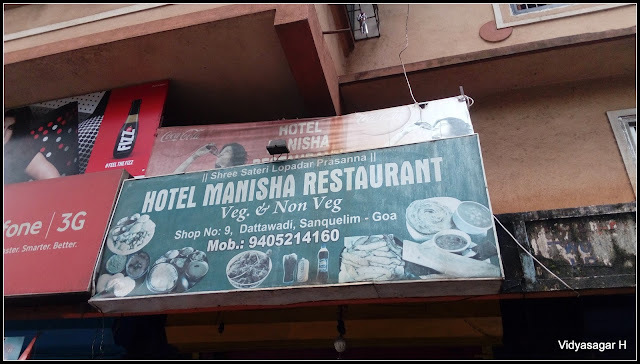 Found a descent small “Hotel Manisha Restaurant” at Sanquelim. The breakfast was really tasty; we filled with Vada-Paav, Buns, Samosa, and Tea. 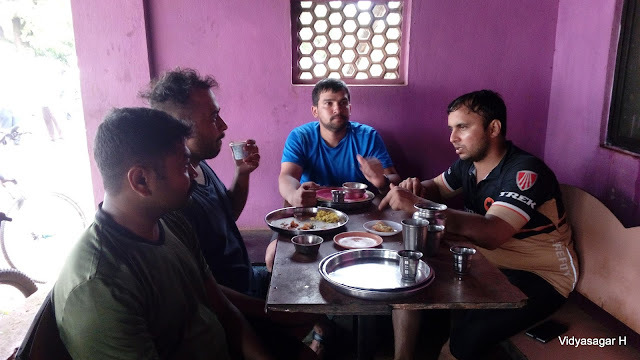 Heavy breakfast made us little lazy, however the day stretch a long and long steep ascend to Belagavi was not so easy through Mahadayee & Chorla Ghat. Arun bus departure was early than all of us, so he decided to move fast departing from the group. He adieu us from the group and left early. 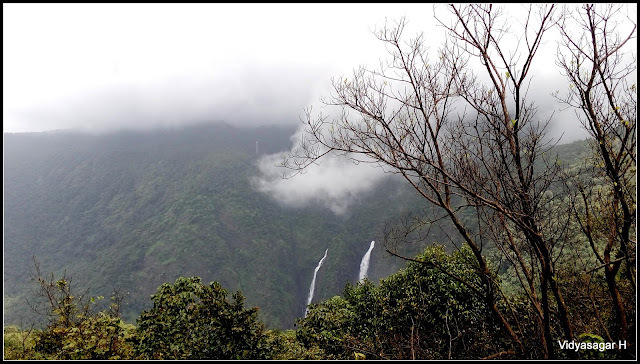 Now our group become five members, continued our journey towards Chorla Ghat. Soon we crossed Sanquelim, the steep Ghat welcomed us. 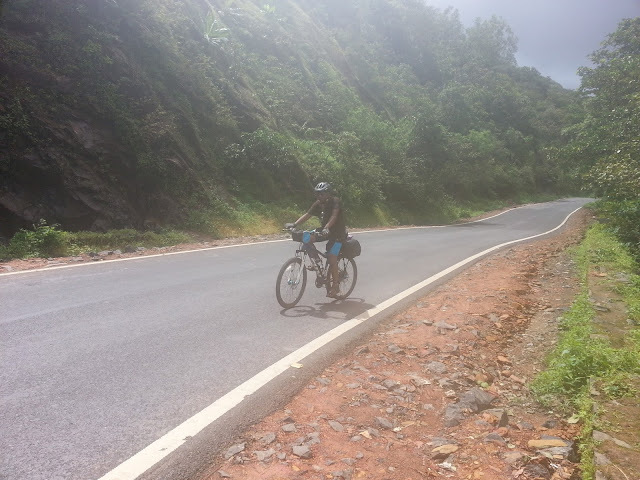 Nothing much experience today except the steep ascend in the Ghat. 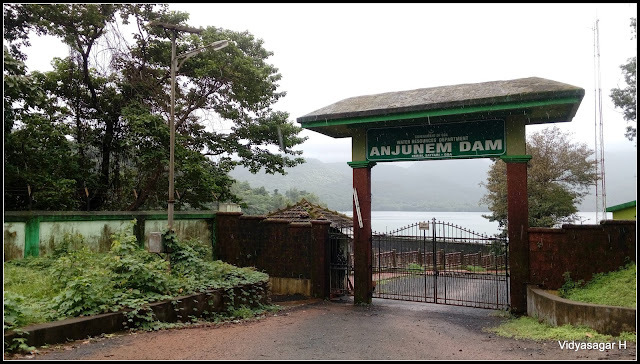 We reached on the way a small “ANJUNEM DAM”, Kerim, Sattari - Goa. The security personnel not allowed us to visit the Dam, continued our journey. Depends upon our capabilities, we all become solo riders. Certainly I was the last person, I was enjoying the ride like a solo. 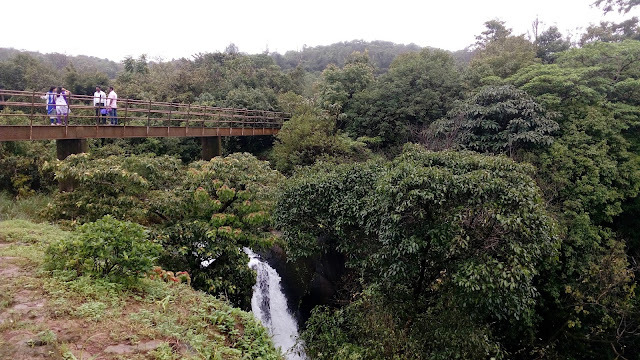 We soon entered into Madei Wild Life Sanctuary. 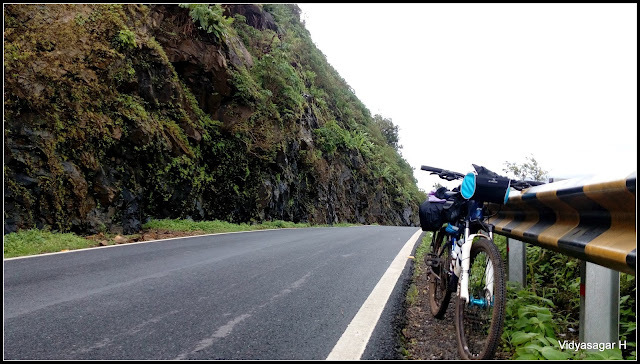 The roads were lonely except wind; in between the vehicle movement; light drizzling and scarier silent of valley. 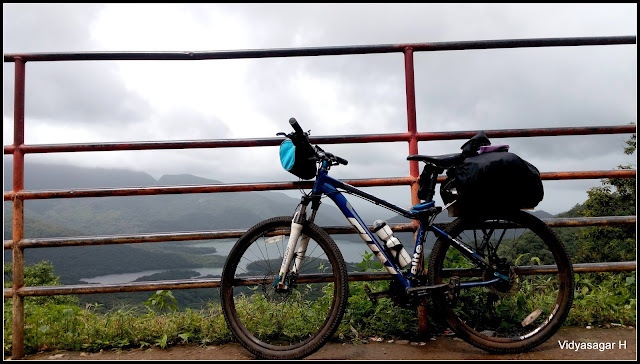 Whenever I was feeling tiered, parking the bike side and enjoying the nature. 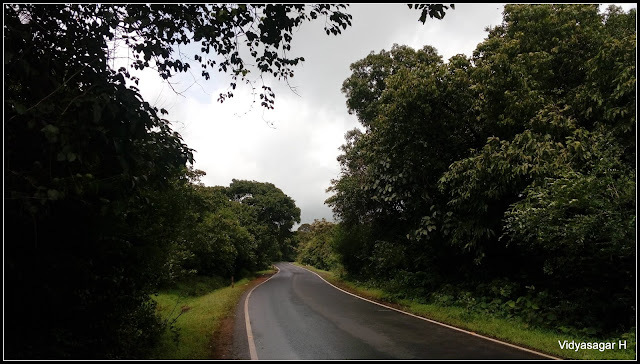 Lonely roads leaded towards the Belagavi. Slowly we getting a good hike; the valley become deeper and deeper. The spectacular view of entire valley was more beautiful. As beginning said, the stretch was really more challenging for all of us. I was asking the opposite traveler “Aur kitna door hai ye chadai hai” (for far this steep ascend)? 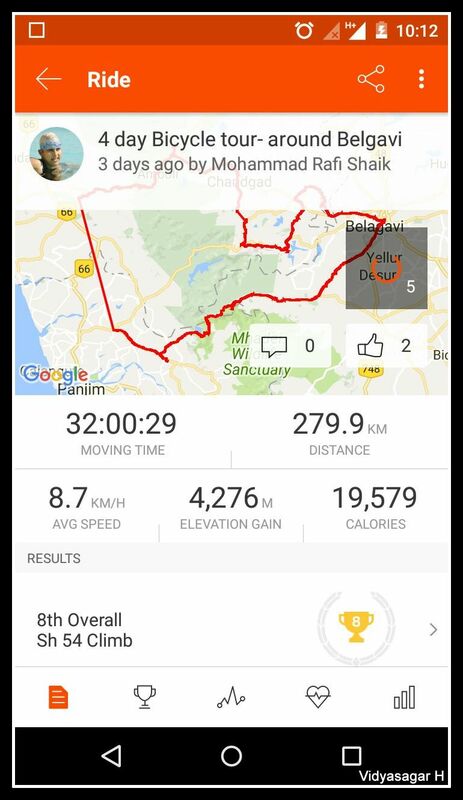 The answer was come down from 25KMs to 2 KMs. We ourselves talking each other that, people does not the distance. Taking multiple breaks at last we reached the Karnataka border by 12 Noon. Someone said the border is the ending of steep ascend; no it was not. Continued the journey towards Belagavi. From the border Belagavi is around 60+ KMs. Rafi was motivating us showing the GPS about the steep ascend distance and asked us to push further. Now the time to have the Lunch. 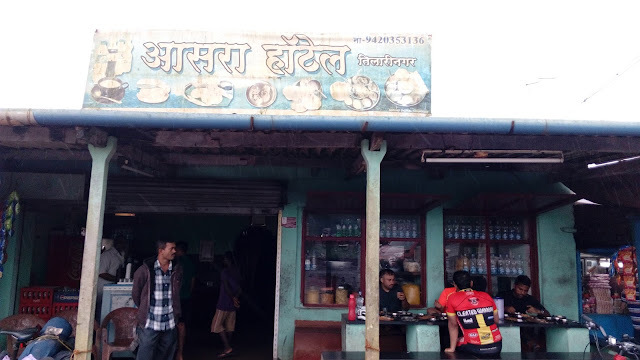 We got a good roadside Dhaba “Hotel Tulasi”. The hotel was empty and we were the customer. Ordered Thali to all of us, hot food gave relax to our stomach. Very soon two buses reached the hotel, and it was filled with people. 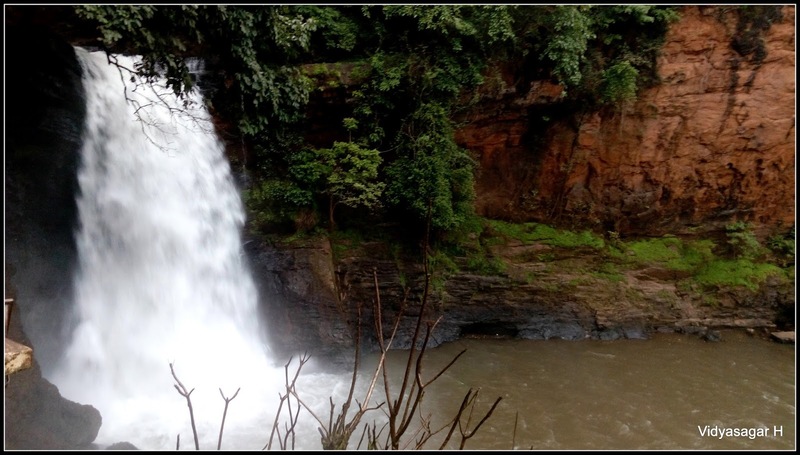 The next destination was Surla falls. I had been this place last year too, decided not to visit the falls if it is more than 4KMs. Luckily the distance from the main road to falls is around 3KMs, so decided to venture it again on bike. Three KMs stretch again the challenging one, 70% of the stretch is again steep ascend. 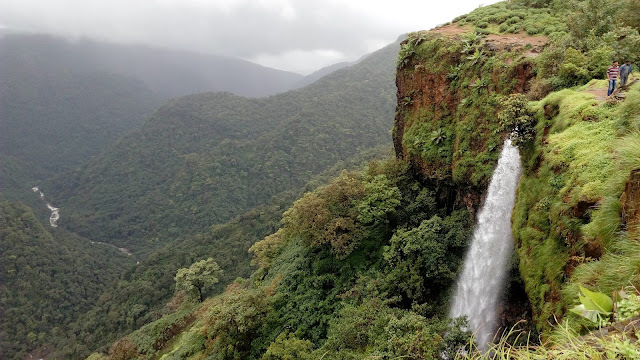 Spent some good time, enjoyed the view of Sural falls, and continued our journey towards Belagavi. At one point of time decided to pool the goods vehicle to drop the Belagavi if time not permit to reach on time. 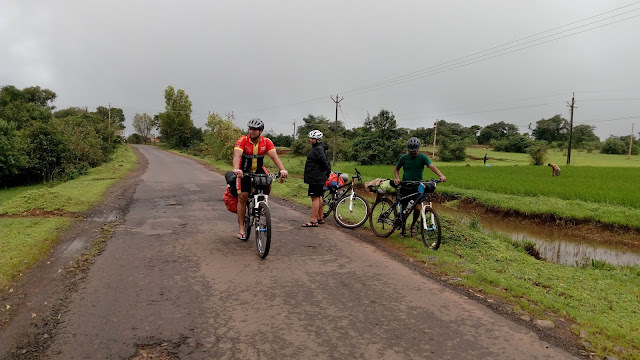 Considering our short breaks and good ride, Rafi confirmed that we all will reach Belagavi on time. Few of us made a mind to take a drop in vehicle and finish the journey. Even I was too tiered and decided to stop the riding and get into some vehicle. BUT my mind was completely ready to accept this!!! I decided myself to stretch where the situation go beyond my control. So I decided to continue the journey. Shanthi Prasad & Deepak decided to stop the ride and take some vehicle drop. 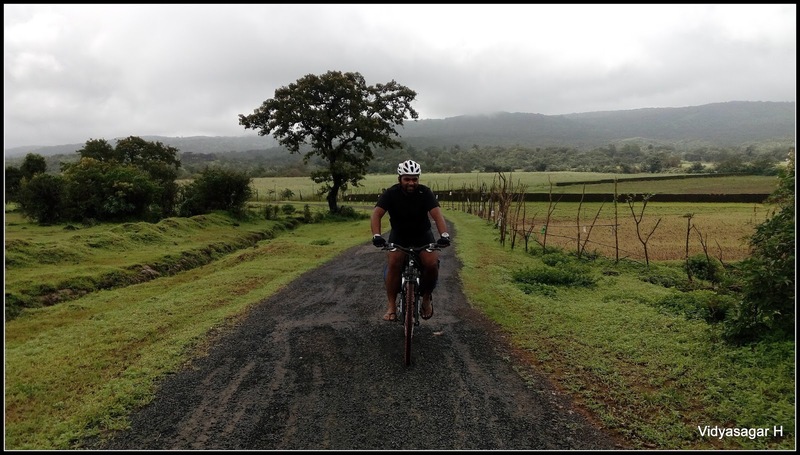 Rafi again motivated me to finish the trail at Belagavi. I continued the journey, now the trail is rolling one. 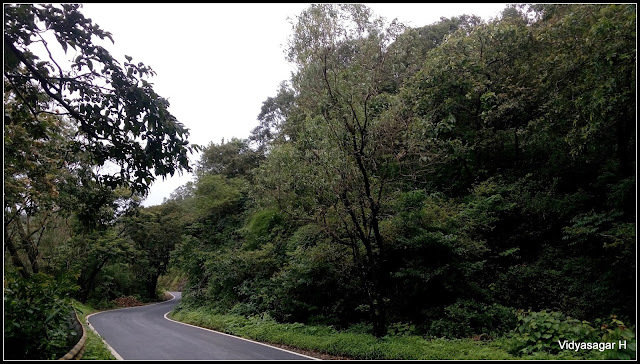 Soon we crossed Khanapur reserved forest, now Belagavi was not away. 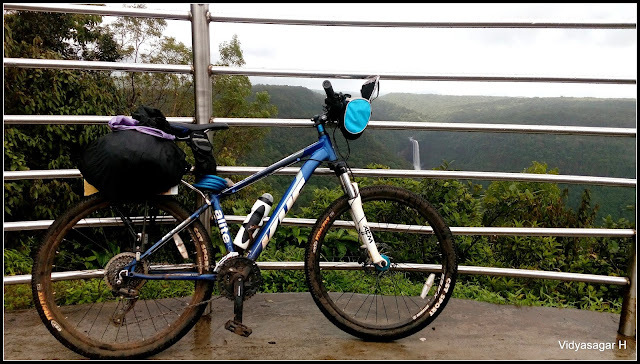 Rafi bike got puncture again when we were 11KMs away from Belagavi. Quickly he changed the tube and continued our journey. At last we reached the ending point Belagavi Bus stand around 7.40pm. I and Rafi celebrated the victory to complete the trail from Belagavi Bus Stand to Belagavi Bus Stand. Got refreshed in the Yaatri Nivas with cold water. Arun was the first person to reach around 3.30 pm. Wonderful speed riding by him. The bus was scheduled around 10pm, did small shopping around bus stand and finished the dinner. The bus is arrived on time to stand, loaded our bikes and relaxed in the seat. The body was badly wanted relax, not talking much and taking more time slip in to the sleep. Morning reached the Majestic around 7.30 am, unloaded our bikes and re-assembled the front wheels. Now the time to depart with team; said good bye everyone and assured meet in the next event. The most memorable epic four days journey ended. Thanks each one of the member for supporting and accompanying the journey. A special thanks to Mohd Rafi for wonderful organizing the event and giving an opportunity to be part of this expedition. Night was very tough to us; woke up early morning and finished the core job. 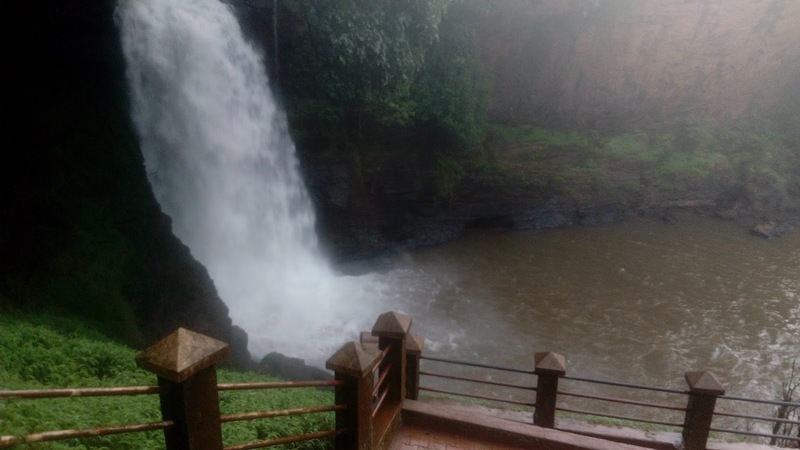 The sound of falls in whole night, was still hitting to our ears. Spent little relaxed time for photography. Rain was pouring non-stop; in between it was giving a small break. All tents were become dirty, struggled little to fold them properly. Packed our luggage and continued our journey towards Amboli. Rafi explained about today terrain. We were happier that, the terrain was rolling down till the Sawantwadi. Started the ride around 7.30 am. Rolling down terrain, we reached a deviation point where we wanted to visit the KAVALESAD. 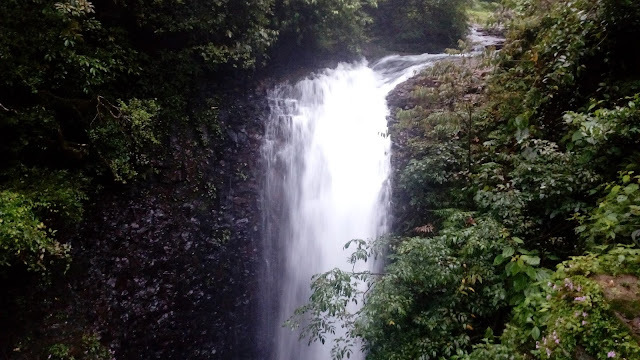 Rafi explained about the place where we can witness the beautiful water falls. Asking the villagers continued our journey. 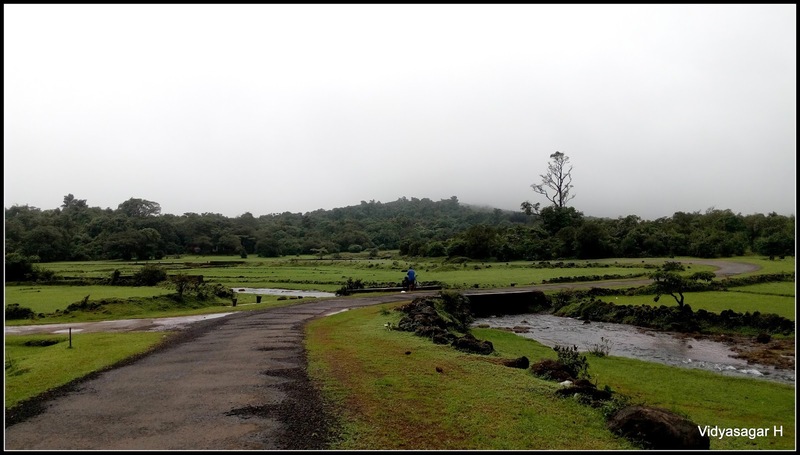 After 3 – 4 KMs from the main road, reached so beautiful place. It is similar kind of Swapnavel view point, however this valley also very beautiful. 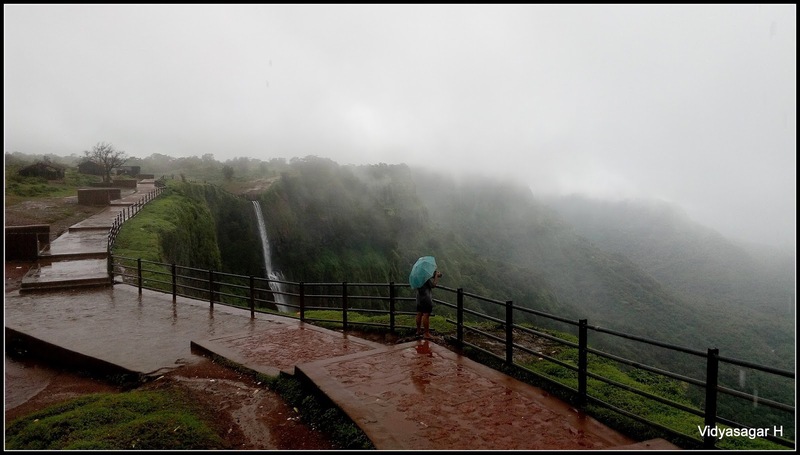 There were countless water falls across the valley. Spent good time for photography. We all badly feeling hungry, most of us not had the dinner last night. Filled our stomach with VADA-PAAV, Corn & Tea. Now we got good energy to survive till the lunch hour. 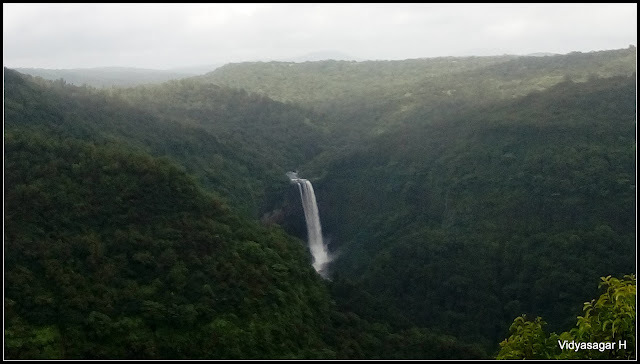 After spending good time, adieu to beautiful heaven and continued our journey towards Amboli Falls. 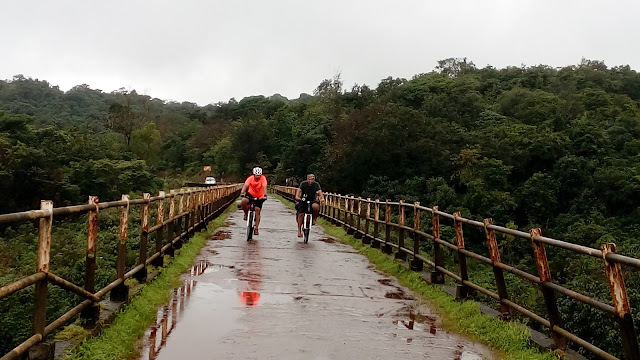 I personally feel, Kavalesad to Amboli village trail is most beautiful of four days cycling journey. It is open grassland with small villages, both the side paddy fields, light drizzling, sometimes the entire range filled with fog, rolling terrain, countless water small streams. 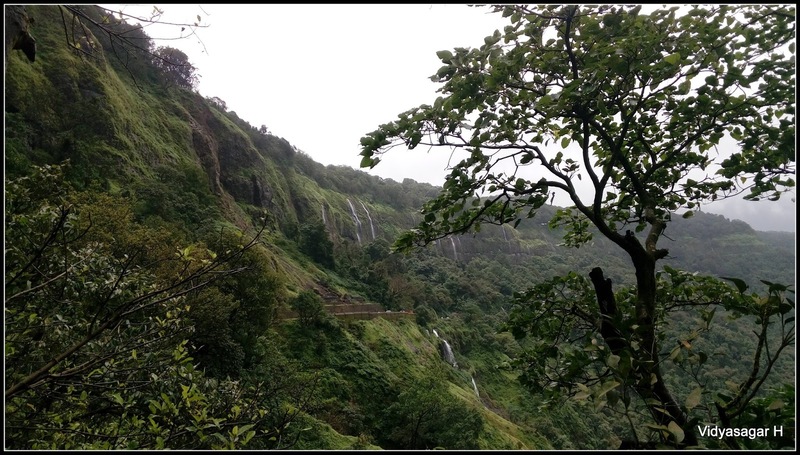 I just loved this trail, spending good time for photography reached the Amboli Falls. 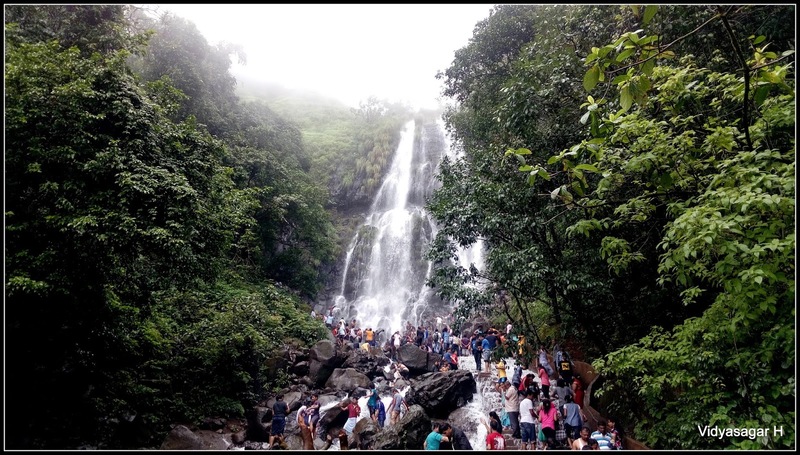 As we expected, the crowd was more at falls. I felt, the crowd was little less compare to last year. We had not enough space to spend the time, so we continued our journey. 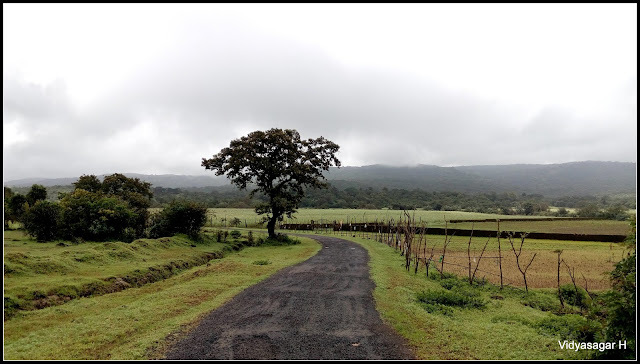 This trail was completely new for me, last year we turned back to Belagavi from Amboli Falls. There were enough numbers of falls across the valley. It is similar like our Charmadi Ghat. 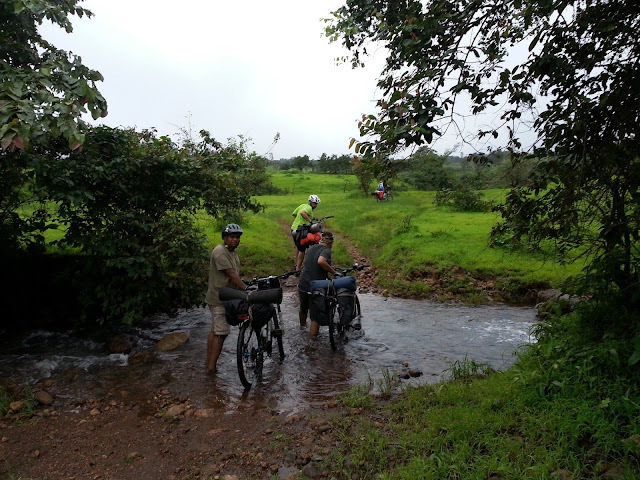 Rolling down terrain so soon we hit to Sawantwadi. 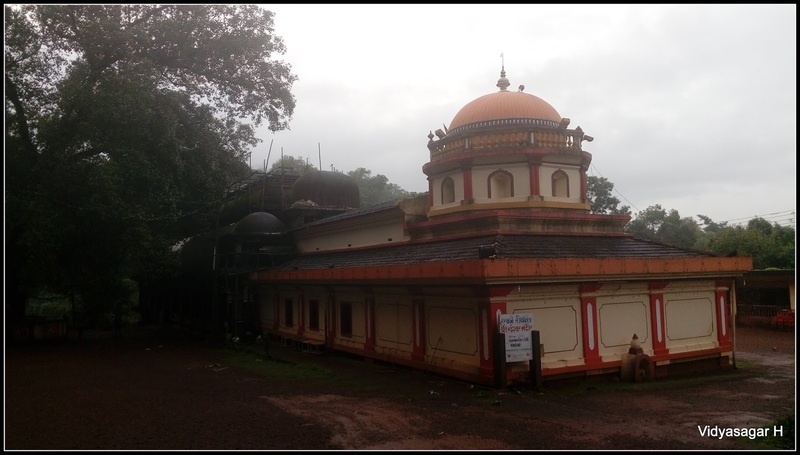 It is a Taluk of Sindhudurg district. According to Vegetarian & Non-Veg, we split into two groups. 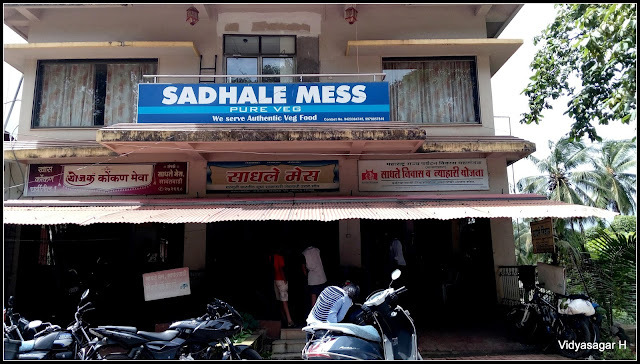 Asked the local people about to suggest some good hotel, they recommended to visit SADHALE MESS. We four continued in search of the mess, there was a shocking!! Many people already waiting outside. Enrolled our names and waited for our turn, at last we got entry into Mess, had yummy lunch. Really the food was very tasty. 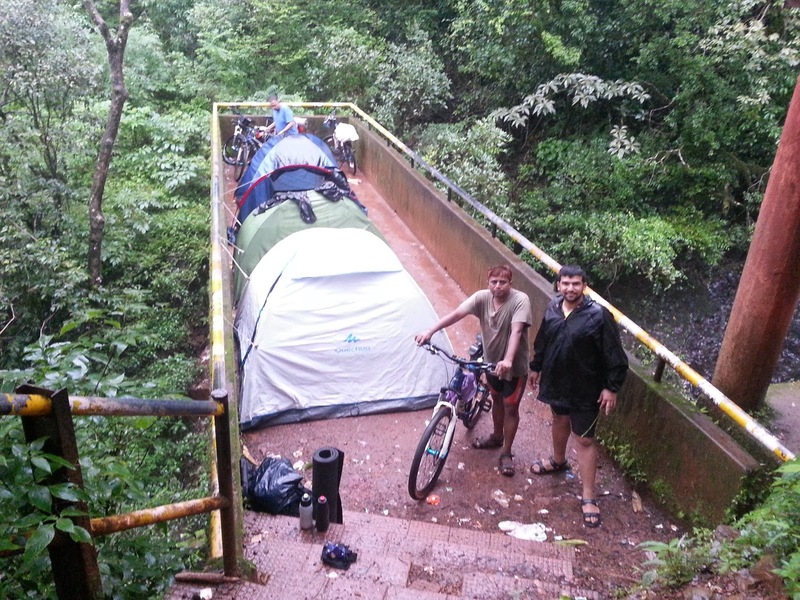 Rafi & Deepak were waiting us at Sawantwadi Bus Stand. Soon we also joined with them and discussed about the next trail. 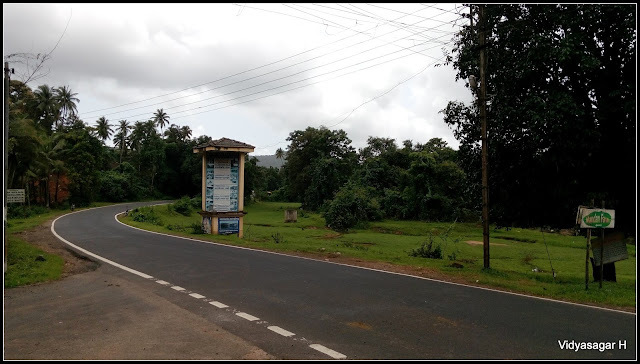 Rafi suggested to take a local bus from Sawantwadi to Assonora (Goa State) which is around 45KMs. 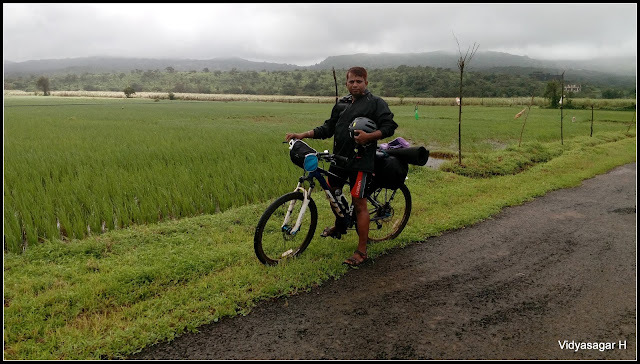 The reason behind this was, first thing it is flat terrain on highway and secondly we have to cover the 4th day trail almost 90+ KMs. Considering the facts we all agreed to sail in bus. Luckily we got a bus, initially conductor refused to take us, Driver asked us to load the bikes on top. We all took out our luggage and loaded the bikes on top of the bus. 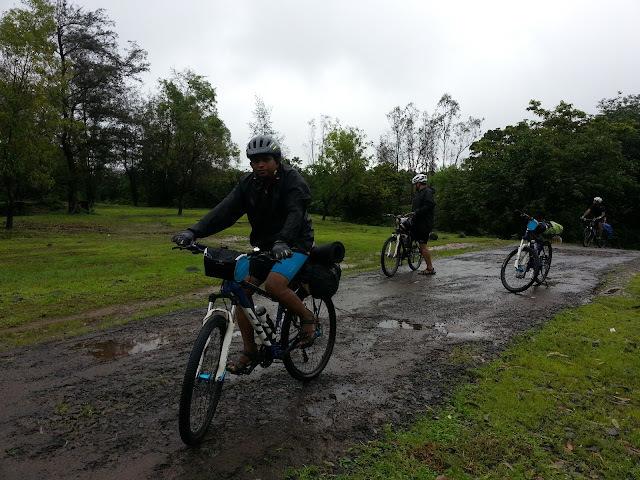 Suddenly heavy rain started to pouring, by great difficulty Rafi & Arun could manage to load the 4 bikes on top. Two of the bikes allowed us to take inside the bus. Quickly removed the front wheels and boarded the bus. We were little lucky that the bus half portion was completely empty. 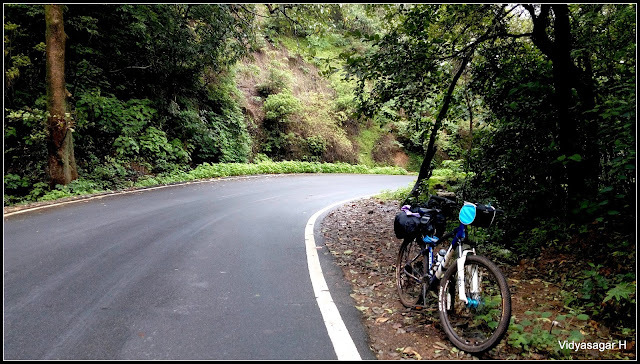 Continued our journey towards Assonora, Goa. Our happy was very short of half empty bus, soon passengers boarded one of the town and it was full pack. Now we more worried about taking out the bikes through the passengers. I and Deepak had very humorous incident. 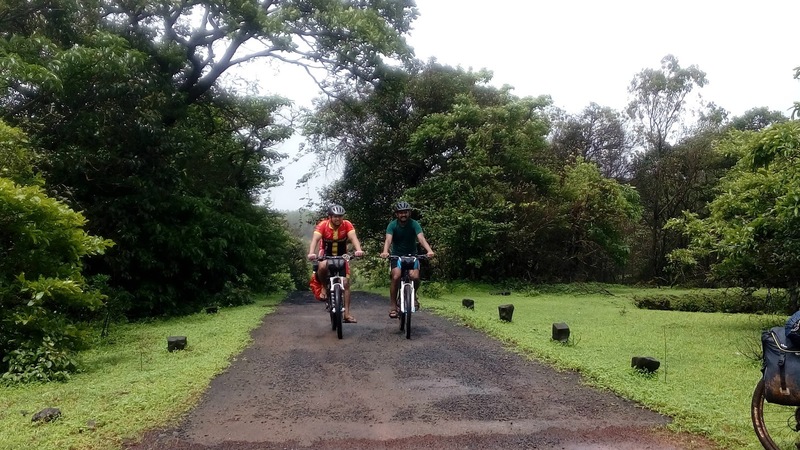 We decided to say public that “THUKU NAKA” (In Marathi – Don’t Split) and take out our bikes. This slogan was written inside the bus for Tobacco chewer. We were lucky, the bus was completely got empty at Assonora. 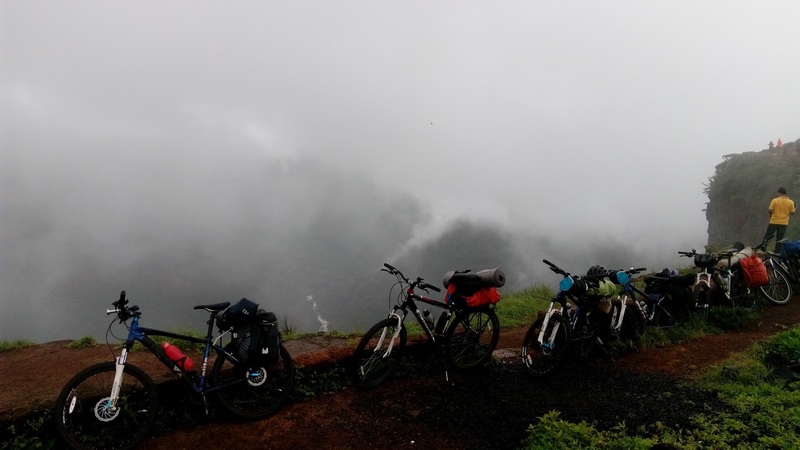 Very quickly we took out our luggage, Deepak & Rafi unloaded our Bikes from the top. We all set ready to continue our journey towards Sanquelim, the night halt destination. 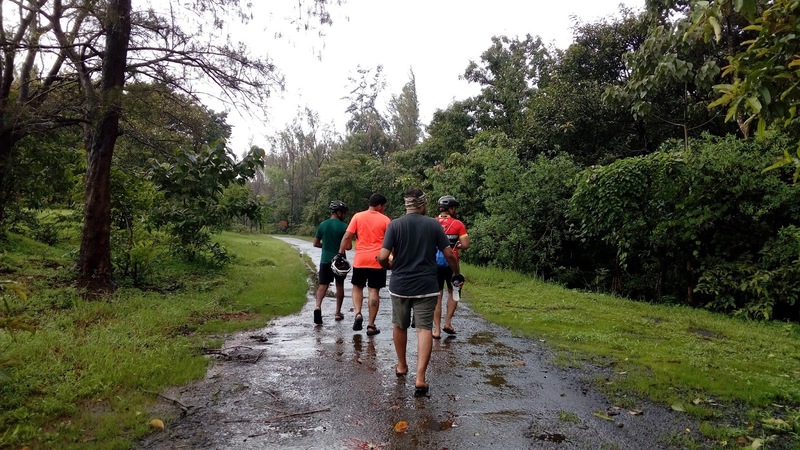 The distance was around 20 KMs, we all decided to pedal fast and reach the camping site. The terrain was mix of ups & down, the drizzling added cool to our ride. On the way Rafi bike got puncture, replaced the tube and continued our journey. 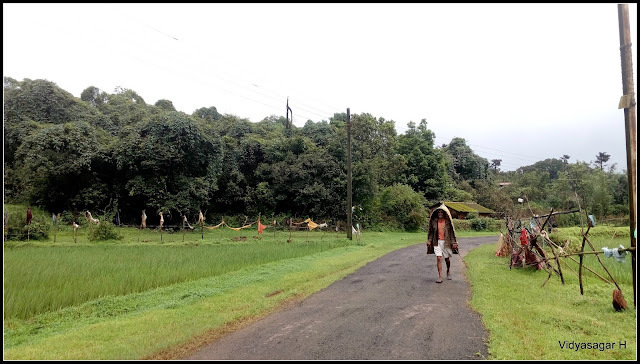 Soon we reached Harvale Sree Rudreshwara Temple. We can find a beautiful waterfalls beside the temple. 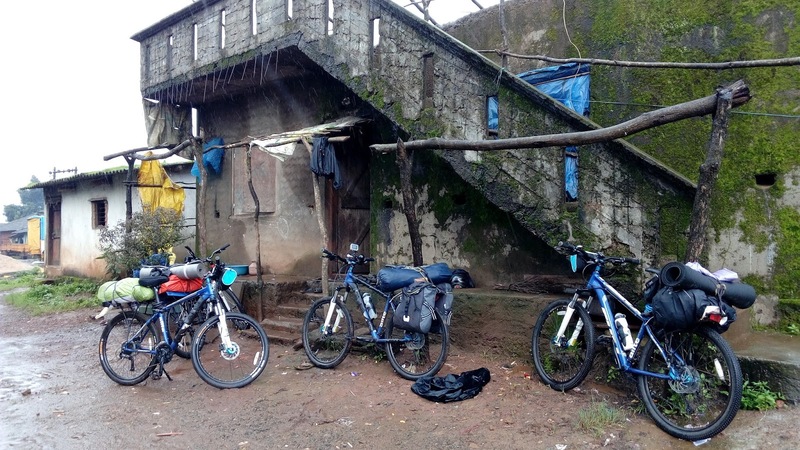 We parked our bikes and taken out the luggage. 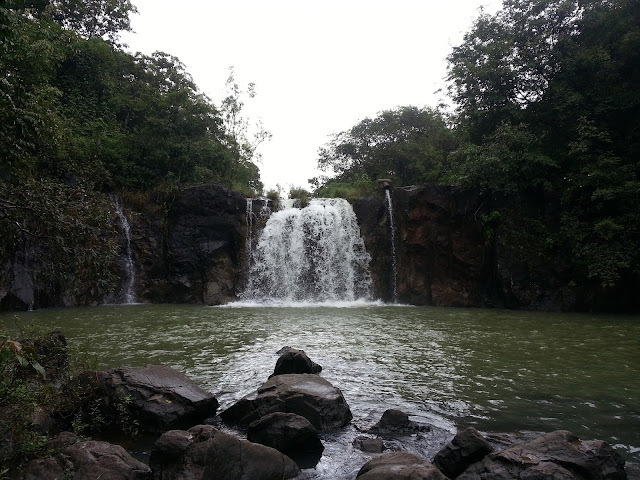 Explored the surrounding place of water falls. Decided to night camp at this beautiful holy place, the challenge is getting the permission from the Temple authorities. 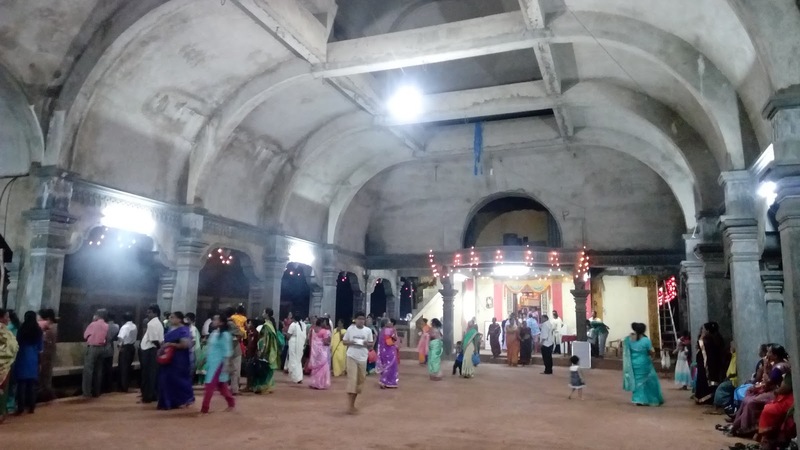 Since Shravana Monday, some special Pooja was held at the premises. I, Shanthi Prasad & Rafi went to approach the authorities. We succeeded to convince then not litter the place and keep calm. Also they informed about the Prasad [Dinner] at 10pm after the Maha Mangalarati. Now the time to get refreshed in the cold water. There was a beautiful natural pushkarani formed by the falls. We all set to take a holy dip, washed our cloths and got refreshed. Spent some good time for Bhajan and had yummy Prasad in the night. We all set into our sleeping bag around 11pm. The day was cool, comparatively last two days. Not much terrain, we enjoyed the day. Inside the tent we were getting little light; the time was to wake up. I was completely in deep sleep, in between I woke up few times. Previous night we all decided to leave at the early, since day one journey lagging around 10Kms as per planned. The drizzling was on its job, finished our morning core work and spent good time of photography. It was perfect spot for landscape photographers. Packed our tents and loaded on bikes continued our journey around 7.30 am. We were hungry because of last night empty stomach, decided to attack first shop of any village. Peddled around 30 minutes, we did not find any village. At one point, we got deviation, thought to wait for some time to get assistance with localities, luckily we got motorbike guy. 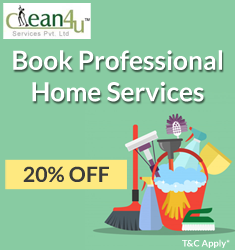 After inquiring the person, understood that, till Tillari Nagar there is not a single hotel. 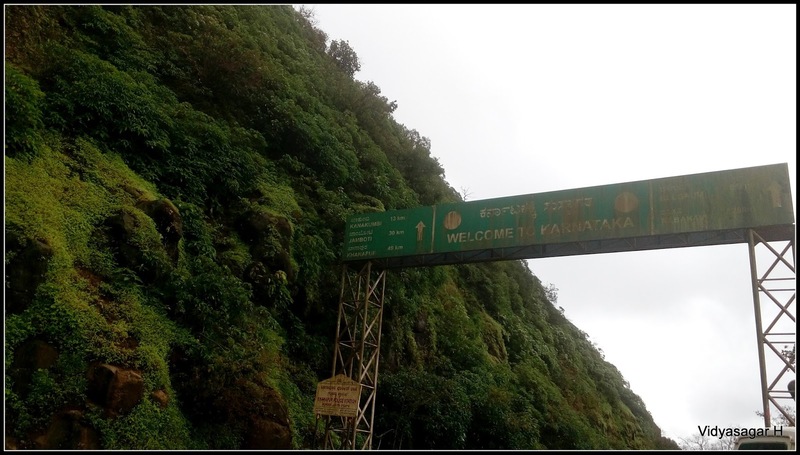 The distance was around 18KMs steep ascend. Asked about the another road which was leading towards right, he told that it, it leads a small village where we can find some biscuits. Decided to test our destiny, headed towards the small village [not remember the name]. A bunch of kids rushed towards our bikes with curiosity, and also a young guy reached us. We just asked about getting any chance of breakfast. Happily invited us to his home and gave the option to choose Upama or Phova. All of us asked the Phova, during waiting period we had some biscuits. There was playing super hit Hindi movie songs in TV. The hot yummy Phova served with love and affection, followed with strong Tea. We thanked God and the sweet soul of the house, continued our journey. Again we hit the dense forest, the trail was scary with no any soul, soon we reached to Tillari Dam. The gate was closed, no-one was there to guide us. Rafi checked in GPS and confirmed about the place, parked our bikes inside the compound and headed towards the Tillari Falls. 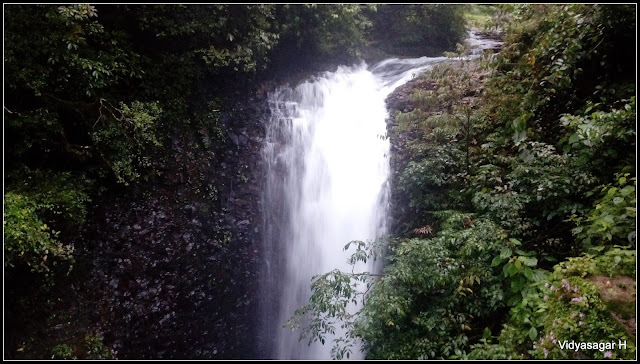 A small 500 meters walk in the forest, took us the beautiful waterfalls. Very painful view was, the entire place was littered with broken wine bottles and plastics. Spent little time and back to our bikes. By the time security guard reached to the chowki. Requested him to allow till view point of the Dam, however he was refused to permit without prior approvals from the higher authority. 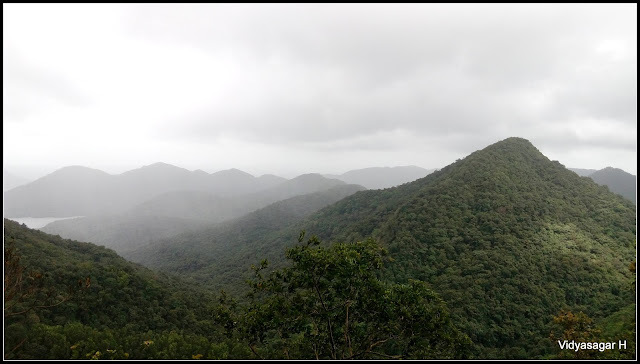 Our next destination was Swapnavel view point. On the way we explored one more beautiful waterfalls. Continued our journey towards the beautiful valley of Swapnavel. This is my favorite spot of last year road trip, unfortunately we had very less time to enjoy. 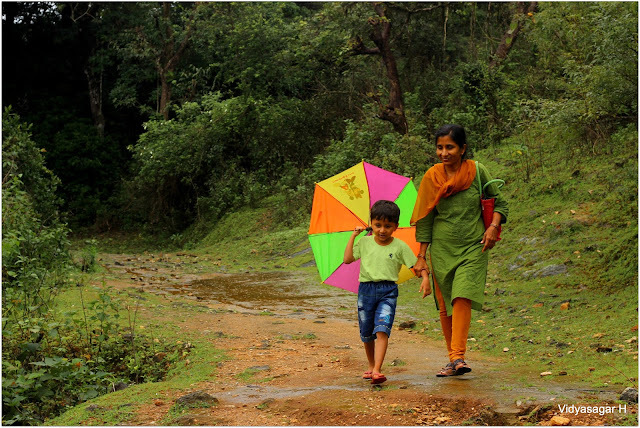 Repeatedly I and Shanthi Prasad insisting the team to move fast to this valley and let us spend a good time there. 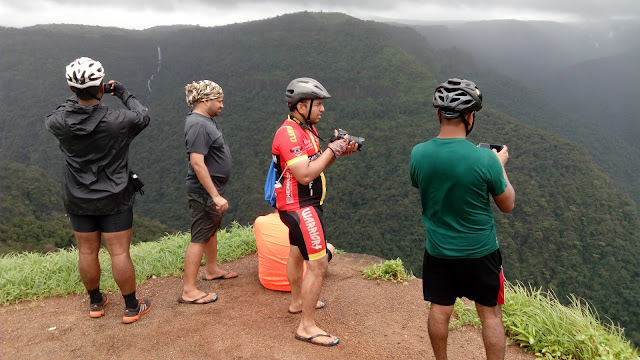 Reached the Swapnavel view point around 12 Noon. The crowd was less compared to last year. Valley was filled with beautiful countless waterfalls. Spend good time, relaxed sometimes and headed towards Tillari Village. Most beautiful place refreshed my last year memories. Certainly its make lot of difference to visit the place on bike & four wheeler. This time we took different trail to reach the Tillari. The road was very scenic, we passed through the narrow bridge. Reached the village around 3pm, had hot yummy lunch in Aasara Hotel. 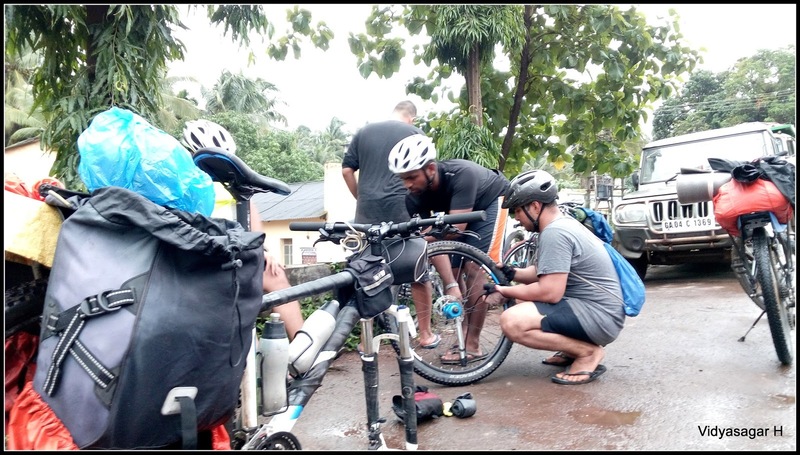 One good thing of biking is, people will ask more and more questions; wants to know our journey, our bikes, greet the children etc. Tillari was not so different, continued our journey to visit near by waterfall. Rafi alone went down to see the beauty of waterfalls, rest enjoyed the scenic view from the top. 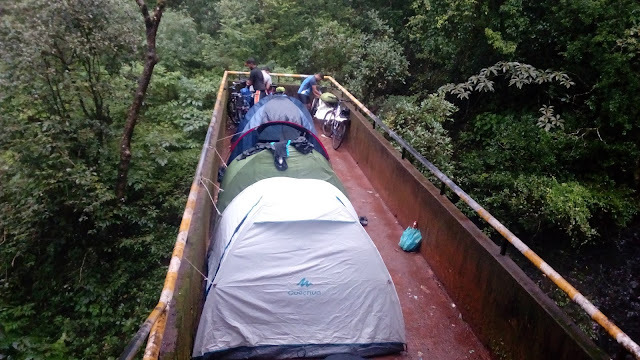 Our next destination is to reach the Amboli for night camping. The time was already 4.00 pm; we have to travel around 65KMs. Rafi asked all of us to speed up the pace, continued our journey. The trail was mix up of ascend and rolling down terrain. Taking multiple small breaks for photography, reached Chandgad town [Taluk place]. Arun wanted to replace the tyre to avoid any bad incident, we could able to find a local cycle guy who had the compatible tyre. Shanthi Prasad & Deepak purchased the grocery for dinner since we were not sure where going to camp for the night. 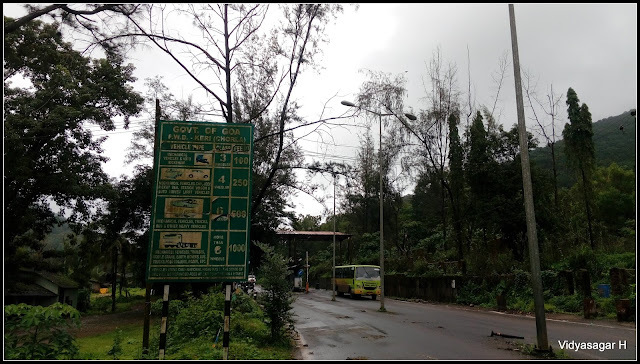 Now the time was around 6 pm, the Amboli was still far around 40KMs. We hit again the Belagavi – Sawantwadi highway. It’s become dark now, continued journey in the night. Took a small break to fuel the hot tea & fill the empty bottle. Feel very happy when people offer for tea / snacks. 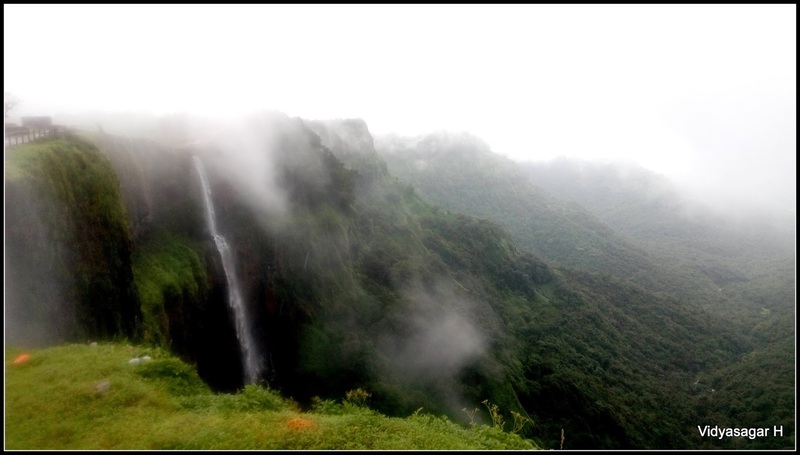 The time was 8pm, Amboli was around 21KMs away. Rafi asked all of us to push hard to reach the Amboli soon. We entered in the Ghat section, the rain was pouring heavily; all were in straight line on the road; become the traffic police and giving instruction “keep left, vehicle is coming”!!! ; enjoying the night ride reached a small Temple Nagaratwadi in Amboli Ghat region. 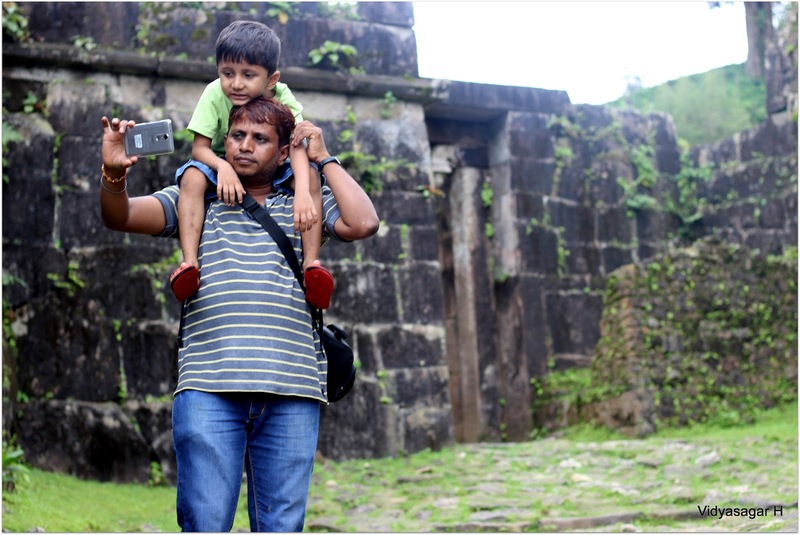 Most of us were tiered and wanted to relax ourselves; Deepak & Rafi went to explore the temple surrounding area. They come up with two strange questions; 1) How many of you not Insured yourself and still want camp in this place? 2) Not sure how so strong the platform which can tolerate all of us for this night?!!! Beside the temple huge gorging waterfalls with deep depth; if you down few steps there is a platform across the falls which built to enjoy the scenic view of the falls. No soul around the temple, except the roaring of falls. 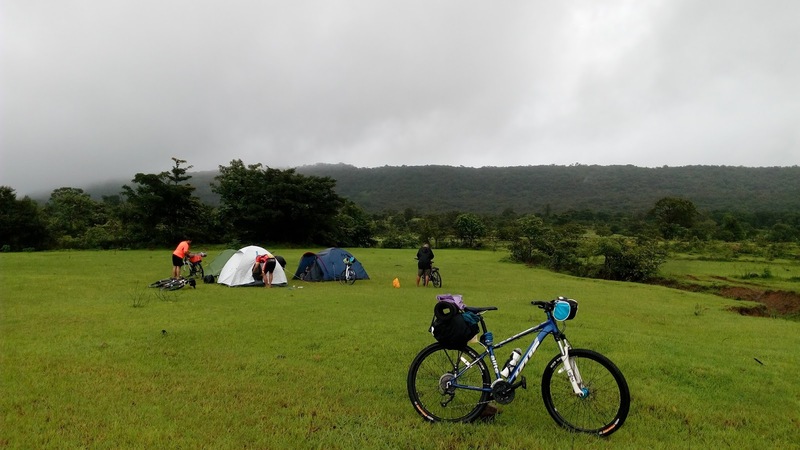 We all decided to stop our day-2 ride and pitch the tents. The rain was on its continue job, the place was little congested, and the whole platform was completely wet. 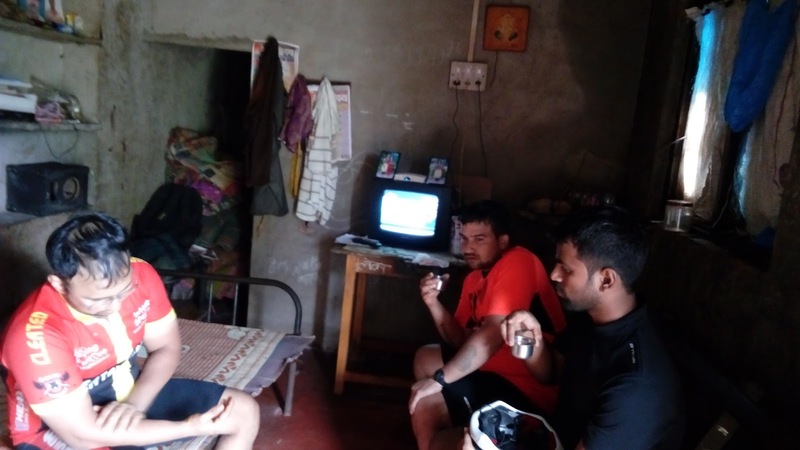 We not bothered about all these facts, brought down our bikes to settle for night. 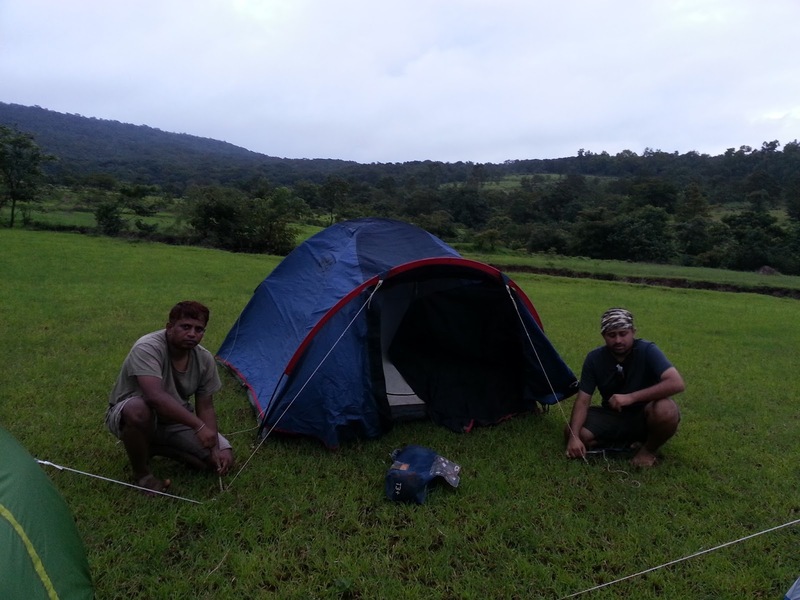 Soon we pitched our tents, changed our wet cloths and settled inside comfortably. I was not in the mood to have the dinner, two banana survived me the whole night. Except me and Sreeharsha, all went up the Temple, prepared the Maggie and finished the dinner. 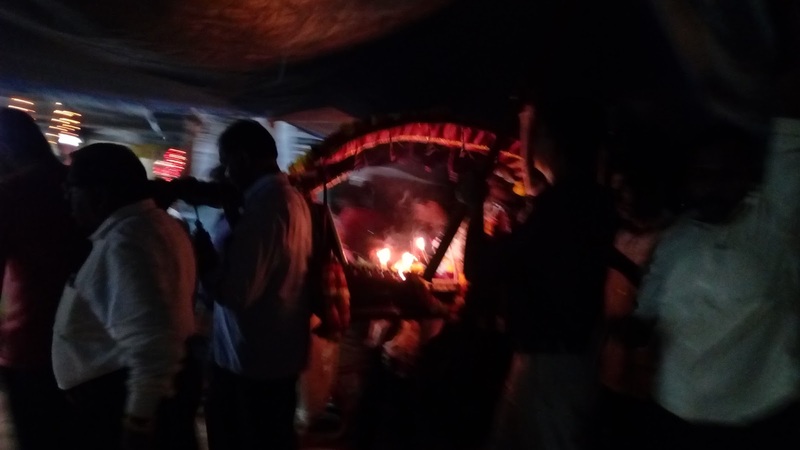 The night was very tough to all of us; rain was non-stop; the platform filled with water. Our entire tent surface got wet, could not able to sleep properly. The day was again most memorable and challenging to all of us. Night riding in heavy rain was the challenging.